In Tim Burton's Batman Returns, the Penguin outfitted his feathered minions with rocket packs so they might bomb Gotham City. 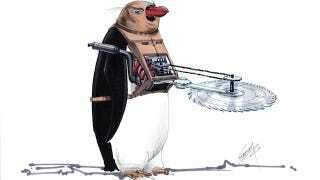 But in Tim Flattery's concept art for the film, the penguins were multi-talents, wearing not just rocket packs but also buzzsaws, grenades, and extending boxing gloves. Flattery says that the rocket penguins with their mind-control helmets are his personal favorites (and who could blame him), but he doesn't say if there was serious production consideration on the Erect-crested penguins with their goofy shirts and tattoos. All I know is that I can't stop giggling at the buz saw penguin with the executioner's hood.